I've spent the past few days playing with a new (to me) amateur radio data mode. It's called JT65-HF, honoring the dean of digital mode creation, Joe Taylor, W1JT. The -HF variant is by Joe Large, W6CQZ. Unlike some kinds of internet-linked communication, it's strictly radio: From my transmitter through my antenna to your antenna and your receiver, and vice-versa. It's what hams call a "Sound card" mode, meaning that it uses audio to connect your computer and radio. That lets the PC's built-in, powerful Digital Signal Processing ("DSP") work its magic. What magic? 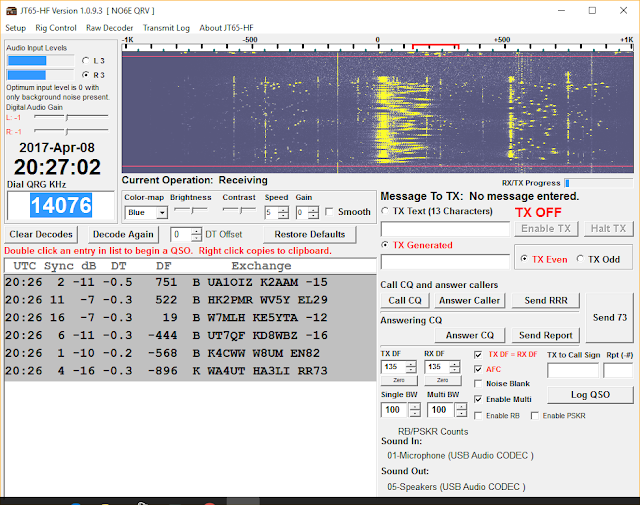 Well, for one thing, a dozen or so JT65-HF conversations can go on in the spectrum space of one ordinary ("SSB" - for Single Side Band) voice contact. For another, we're used to thinking that signals must be above the noise to be discernible. Not so here: JT65-HF digs out signals well below the noise, indeed, signals that one cannot hear by ear at all. What's interesting, and a bit unnerving, though is how easy it is to make contacts. The power of DSP and a hyper-rigid set of operating procedures means that even "LPCA" ("Low Power / Crummy Antenna") stations like mine can make worldwide contacts. It's not a fast mode: You're only allowed to send during ever other minute (48 seconds, actually), and you can only send 13 characters in that time. Apart from a ham radio station and a computer, the only hardware needed is some kind of audio interface, which you can buy or build yourself. The rectangle at the top is a so-called "Waterfall" display, which shows signals being received. They slowly move down, letting you see where they are now and where they were a few seconds ago. (This technology was first used, I believe, in naval sonar systems). The main thing, though, is the darker-gray rectangle on the left. It shows all the signals received in the last minute, including how strong they are, which frequency they're on, and what they said. In a feature carried over from moonbounce modes, everyone transmits on even minutes and listens on odd ones, or vice-versa. That means you and the person you're trying to contact are guaranteed not to block each other by transmitting at the same time. Let's see how a typical contact looks, and what I had to do to make it. Spoiler alert: It isn't much. Ignore the red bar for now. Most ham radio contacts start with a station calling "CQ," meaning "I'll talk with anyone." (There are other ways, but let's stick with that for now. When a station sends "CQ", the program automatically highlights it in green. Looking at the upper of the two CQ-ing stations, KE9DX is calling CQ, and he's in grid square EN61. A callsign lookup says Francis Mah actually lives in Buffalo Grove, Illinois. I double-click on his green "CQ" bar to say I want to contact W8JBL. The program automatically decides what I should send ("W8JBL NO6E CN73"), CN73 being my grid. When the clock says it's my turn, it sends it. The red bar means the transmission is addressed to me. His computer sends both our calls and automatically appends my signal's strength ("-20"). There's no "eyeballing" - the signal strength he reports is calculated automatically. In the JT65-HF world, all signals are reported compared to a reference of zero. The "-20" says my signal isn't very strong. You can see in the square on the right side of the screen that my computer will send "-15," meaning that I hear him better than he hears me. Now I click SEND REPORT. In the next minute, my computer sends: "W8JBL NO6E R-15", acknowledging his report and sending him mine. 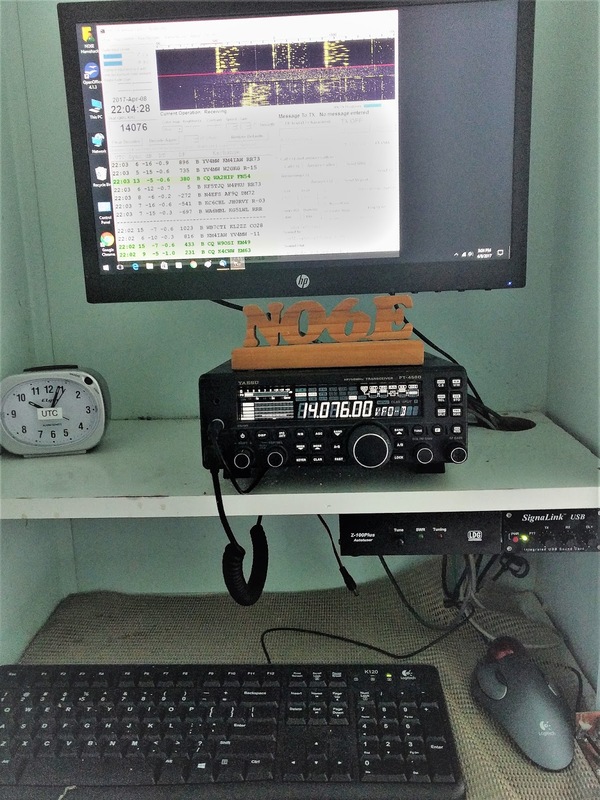 "NO6E W8JBL 73" ends with ham radio-ese for "Best wishes." We're done. 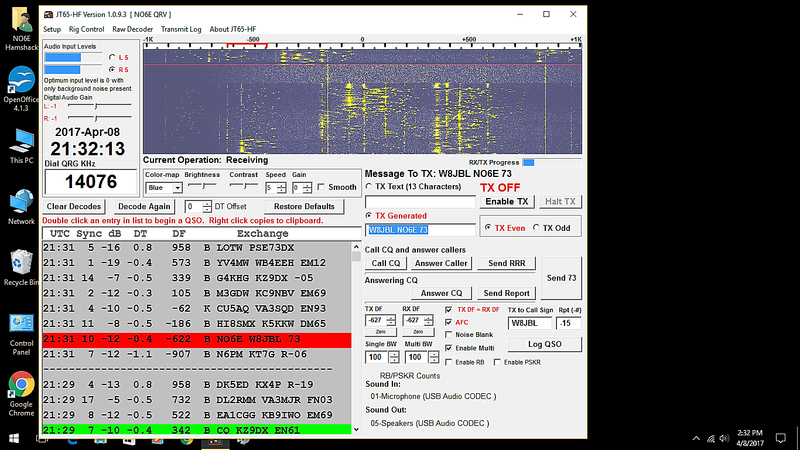 I click the LOG QSO (Contact) button, and the program logs the contact for me. Neither of us did anything but click buttons, and not many of them at that. Neither of us heard anything (I usually leave the speaker turned down, and most others do, too). Neither of us typed the other's call. Neither of us composed the transmissions we made - it was done for us. Is there anything wrong here? Some would say so. Ever since the days of spark, hams have spoken darkly of how the hobby was getting "Too easy." The greatest complaints came when voice communication came along and one didn't need to know Morse any more. (Most of us still know and use it, though). My answer: If you don't like it, don't use it. Many hams specialize in a single mode of operation, either Morse, a data mode or some kind of voice. There's room for all in the hobby. The radio is a Yaesu FT-450D, which costs around $750 new, but is also available used for lots less. The computer (not shown) is few-years-old dual-core Dell desktop that I got for, I believe, $75. The audio interface is the small box labeled "Signalink USB." It cost $130, but it makes things easier by having its own sound card built-in, so it needs only a single USB connection to the computer. The final item is the LDG automatic antenna tuner, a box which "matches" the radio to the antenna. About $150, but you can get by without one or get a manual one for less. 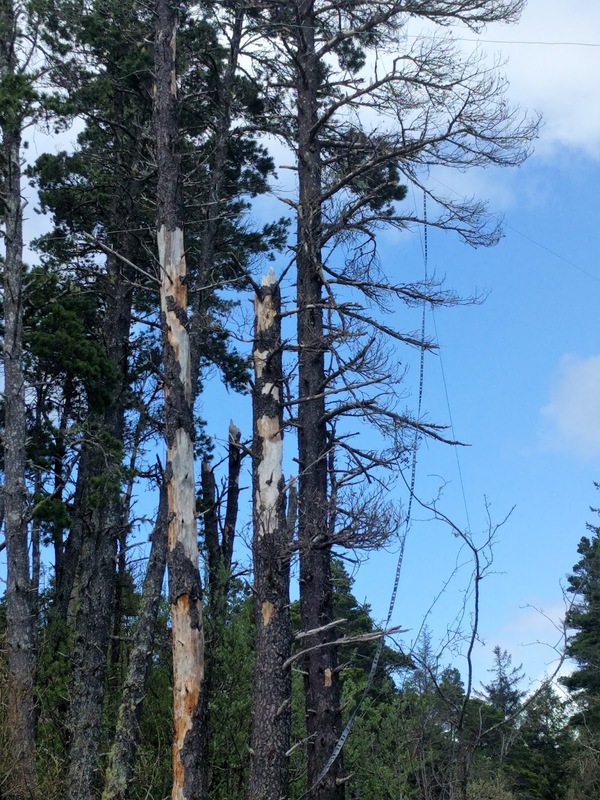 You can see the "Ladder line" sloping up into the pine tree that supports the antenna itself. Nothing fancy here like telescoping triangular towers and huge aluminum antennas. Would I be able to contact more people with a fancier radio and antenna system? Absolutely. But JT65-HF makes it easier for us "little guys" to have fun, too. Interested? 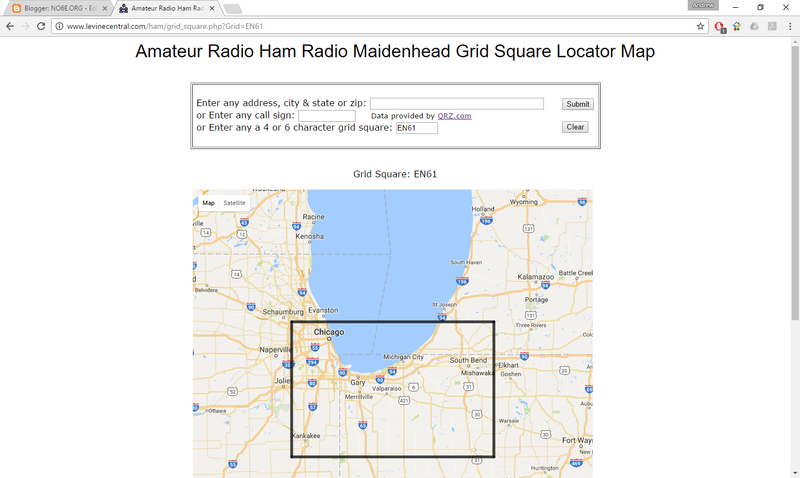 General info on ham radio is available from the American Radio Relay Leauge. Info on JT65-HF is here.